Old Malt Cask Laphroaig 16yo (50.0%): This will be the second Old Malt Cask Laphroaig bottling on tire-bouchon. The first one was an 18 yo expression distilled in 1993 and bottled in 2011. Although this one is from a pretty similar era it is a 16yo whisky distilled in October 1996 and bottled in May 2013 and the refill hogshead yielded only 120 bottles. It is another cask selected by my good friend Brad Jarvis for the US market like the 21yo Aultmore and 18yo Springbank I tasted and reviewed on the blog before. Old Malt Cask range is a line created in 1998 by the independent bottling company Douglas Laing and Co. to celebrate the company's 50th anniversary. I believe the idea of choosing the standart bottling strength as 50% was also linked to that idea. Color: Chardonnay with very slow and thick legs. Almost like a vegetable oil. Palate: Here is the peat... Dry, not medicinal but earthy peat. Fireplace ash and campfire. Beeswax, chestnut honey and creme caramel. Fresh quince slices and grape seeds. Adding water brings plastic food container, cracked black peppercorns and roasted almond notes. Perfect wood influence... You barely feel it but it wraps everything nice and tidy. Finish: Long with sea salt, black pepper and spruce. 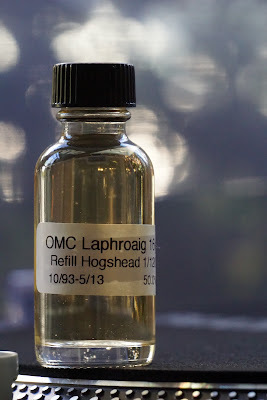 Overall: This is a very nice, delicate and floral Laphroaig. I very much liked it... Those waxy notes both on the nose and on the palate could easily make me think that I was tasting a heavily peated Clynelish in a blind tasting. By now everybody knows how big of an ex-bourbon barrel fan I am but I have to say ex-bourbon matured old Laphroaig's are a real treat. I remember the days when we were able to find these beautiful green hexagonal OMC tubes on the shelves almost in every reputable liquor store at very decent prices. Those days are long gone... They are still around but harder to find and their prices are tripled like almost everything else unfortunately. Thanks to Josh Hodas for the sample.